The Governors of the London Hospital acquired a large tract of land to the south and south-west of their hospital in the eighteenth century. Initially this was a buffer, to preserve healthful open space. But it was soon built up, largely with streets of houses, and has more recently been redeveloped in parts for hospital expansion. This post presents two unconnected but differently surprising sites on this territory, one on either side of New Road. This building has a remarkable chequered, yet consistent, and distinctly Whitechapelian history. It was erected in 1866–7 as a mission house and infants’ school for the parish of St Mary Matfelon Whitechapel. First plans were to extend on the garden of an existing house, but in July 1866 the Rev. James Cohen gained the London Hospital’s approval for complete rebuilding, displacing two houses on Charlotte Street (as the east end of Fieldgate Street was called until 1894), the second so that the top end of Parfett Street (formerly Nottingham Place and a cul-de-sac) could be narrowly opened up. 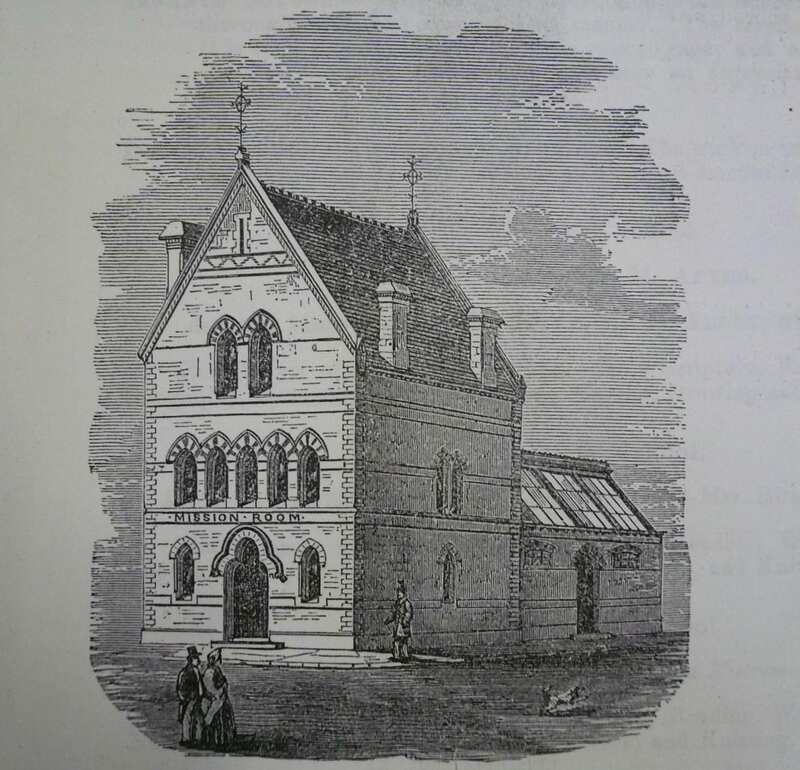 The establishment was known variously as St Mary’s Mission House and the Charlotte Street Infants’ School, the building’s purpose signalled through the use of simple Gothic Revival forms. The originally single-storey rear range had high-silled segment-headed windows and a glazed roof to a room for mothers’ meetings, evening readings and mission work. It communicated with the main block through a wide pointed-arched opening. Double-iron handrails on the main block’s stairs seem designed to provide for young children. Mission use continued up to about 1918. The building was next used for a few years by Jewish anarchists as an International Modern School, following the inspiration of libertarian and non-coercive ‘modern’ schools established in Barcelona by Francesc Ferrer I Guàrdia. Attendance rose to more than 100, but funding difficulties prevented longevity. Arbeter Fraynd (Worker’s Friend), a Yiddish radical weekly paper, and its Jubilee Street anarchists’ club premises had been shut down in 1915. For a time the building at 62 Fieldgate Street was also used as the New Worker’s Friend Club, and by the East London Anarchist Group. 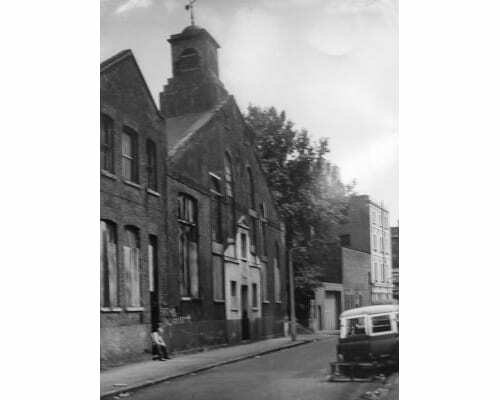 In 1925 the building was converted into a synagogue for the Linus Hazedek and Bikur Cholim congregation, founded with a mission to help the sick, and moving here from Burslem Street on the other side of Commercial Road. Parfett Street had been further widened to the west in 1902–3, and a new door was formed in that side elevation in 1934, but the synagogue did not survive beyond the 1940s. Abraham Spitalowitch, a tailor, was in occupation by 1951, and other garment-makers passed through. Conversion works for continued rag-trade use that included raising of the former classroom to the rear were intended from 1978, but not carried through, though a shopfront for a showroom was inserted in 1981 for Sophia Fashions. Thereafter the building fell into dereliction. 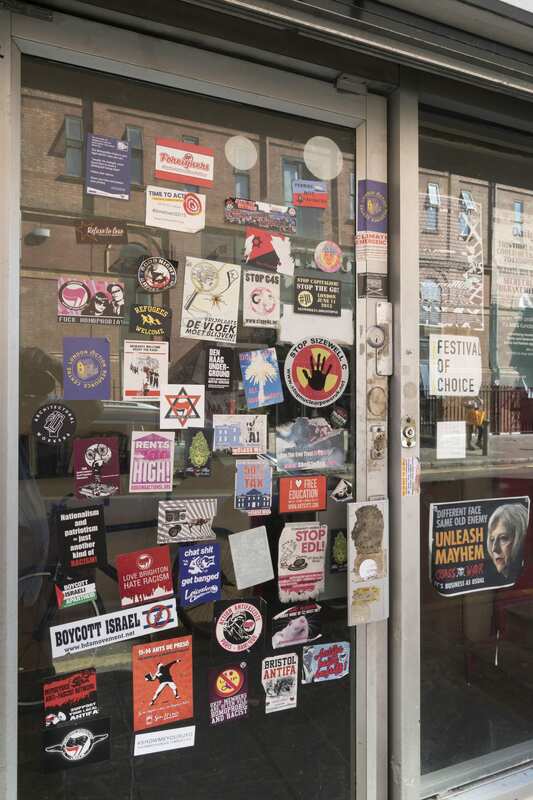 In 1999 a group arising from that decade’s Reclaim The Streets movement conceived the need for a base or action resource centre for direct-action and anarchist groups. Without awareness of the building’s history, 62 Fieldgate Street was purchased, largely through a single supporter with inherited wealth. Refurbishment works for office, workshop and library use as what was initially the Fieldgate Action Resource Centre were carried out in 2001–2 to plans by Anne Thorne Architects Partnership. These involved rebuilding and raising the rear section, which was given a roof garden. Figural graffiti on the shutters is by Stik. 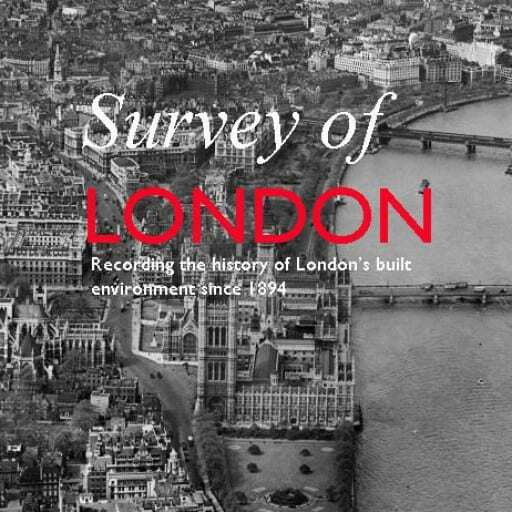 The Survey of London gratefully acknowledges information supplied by Mark Kauri, Laura Oldfield Ford, Tina Papanikolaou and Aikaterina Karadima. This sleek glass-fronted block was constructed in 2003–5 to provide a medical research centre for Queen Mary University of London. 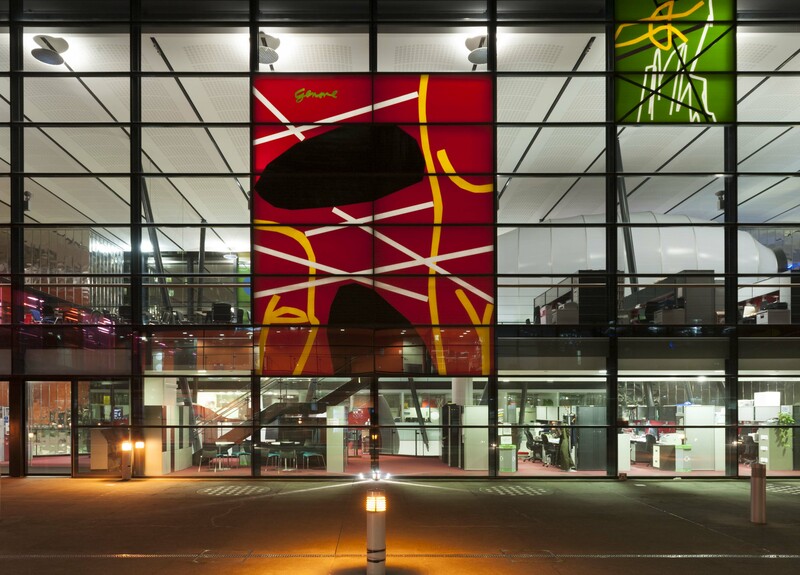 It was designed by the late Will Alsop in collaboration with AMEC, with Adams Kara Taylor as structural engineers. 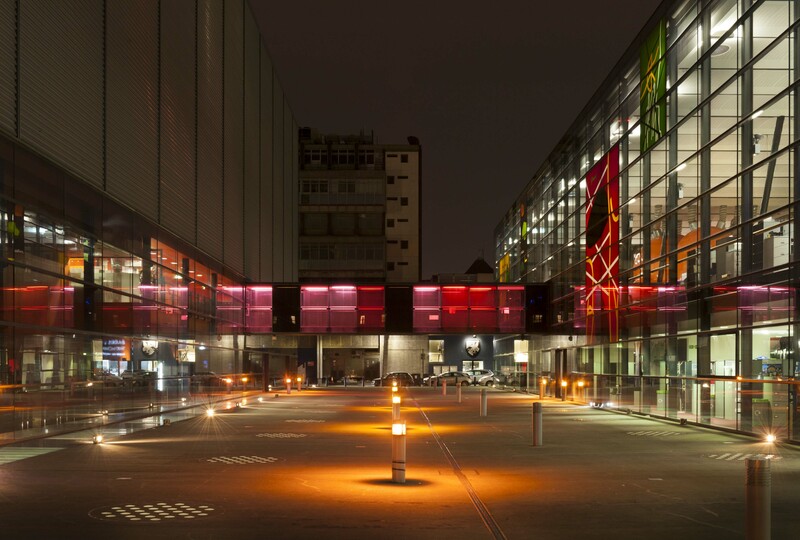 The building occupies an extensive site on the London Hospital estate, bounded by Newark Street to the north, Turner Street to the east, and Walden Street to the south, with its western boundary abutting the university’s Abernethy Building and Biosciences Innovation Centre. The Blizard Building is composed of two narrow glass-clad steel-framed pavilions east and west, separated by a central paved yard. These discrete monolithic blocks are connected at first-floor level by a slender bridge encased in panels of bright pink and red glass, and an extensive concrete basement that engulfs the larger part of the footprint of the site. 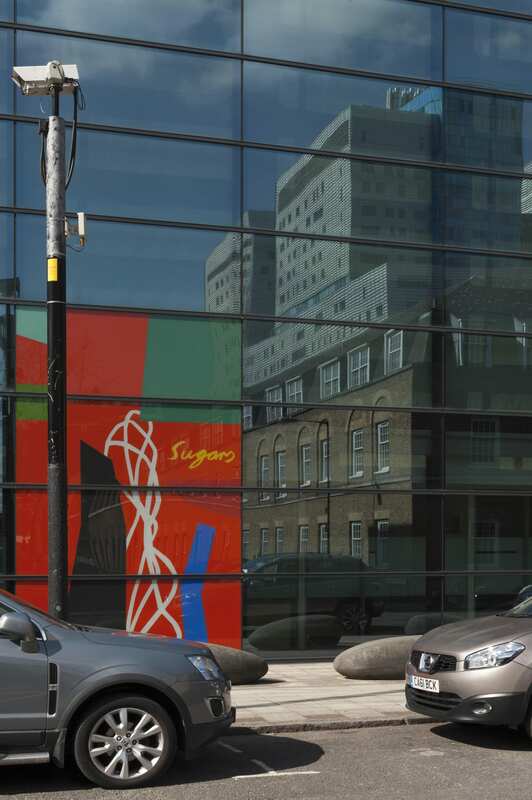 The glass cladding of the pavilions is adorned by a series of colourful panels designed by the artist Bruce Mclean, and incorporates words chosen by Professor Mike Curtis and Professor Fran Balkwill, scientists based at Barts and the London School of Medicine and Dentistry at Queen Mary University. The building is named in honour of Sir William Blizard, the eminent surgeon and one of the founders of the medical college which opened at the London Hospital in the 1780s. The east pavilion of the Blizard Building comprises offices and study spaces skirting a large void, occupied by four pods of pioneering constructional complexity, each ‘playful, curvaceous, hollow and equally outlandish in different ways’. Supported by a series of steel props and suspended steel hoops, Centre of the Cell is a two-storey children’s educational unit and exhibition space encased in an orange bubbling structure inspired by the nucleus of a cell. Its smooth surface contrasts markedly with Spiky, a prickly steel-framed structure zipped in a black PVC-coated polyester membrane. Both structures were designed and assembled in collaboration with Architen Landrell. Design & Display was contracted to produce Cloud, a steel-framed elliptical structure raised on steel legs, and Mushroom, an open deck supported by three vertical concrete posts. Cloud and Spiky contain spaces for seminars and meetings, and Mushroom is a staff social area. 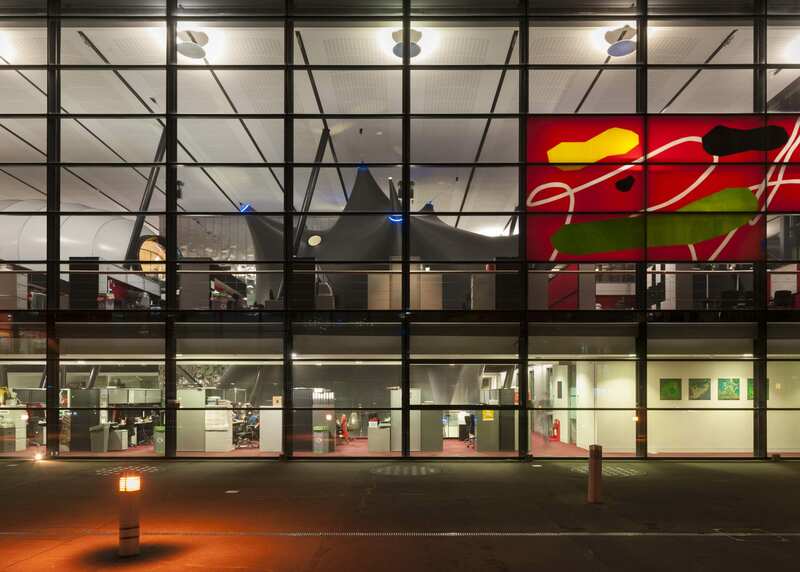 The narrower west pavilion contains a double-height entrance foyer with a cafe, service plants, and a lecture theatre with tiered seating for 400 spectators. The large basement extends beneath the pavilions and the yard, receiving natural light from circular skylights and the light well in the east pavilion. It contains an assortment of open-plan and separate research laboratories. At the time of writing, a ‘neuron’ pod is in the course of installation at the north end of the bleak yard between the pavilions. Accessed via the central glazed bridge, this addition is intended to provide space for educational workshops, events and exhibitions. 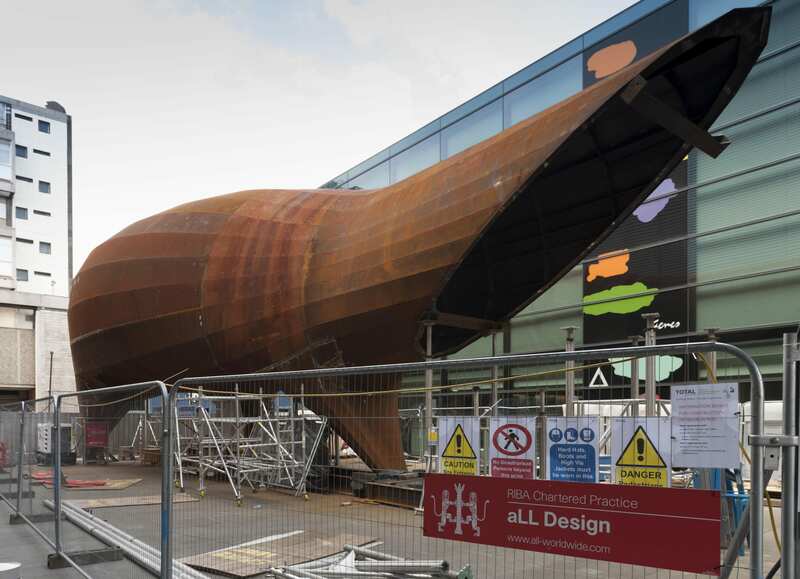 Designed by Will Alsop to represent a nerve cell, the new pod will be a prefabricated steel-framed structure resting on three legs, its main body encased in a steel skin sprouting acrylic fibres. Building, Vol. 270, No. 8383 (27 May 2005), pp. 38–45. 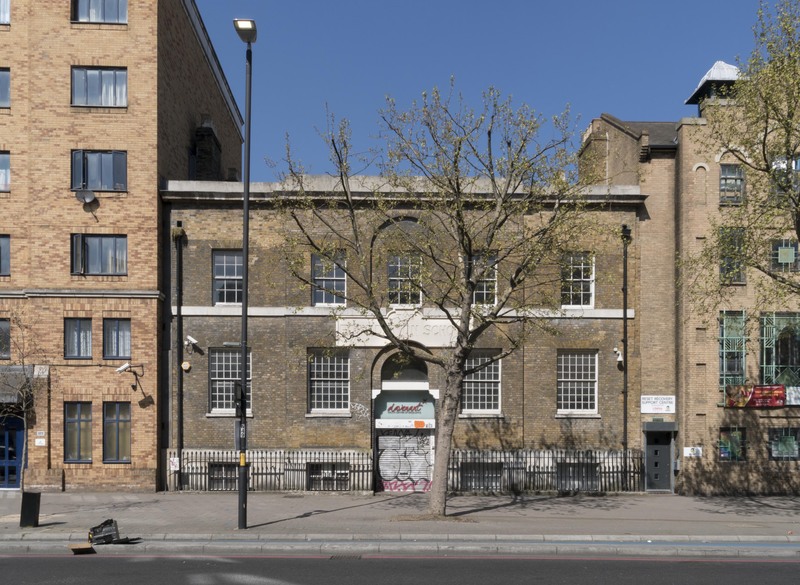 An undemonstrative road-side building of 1818 and a showy but concealed rear addition of 1895 are all that is left standing in Whitechapel to represent a significant educational history. This spans more than three centuries and a site that extended from Whitechapel Road to Davenant Street and Old Montague Street. Until 2017 this history was sustained by a youth centre that perpetuated the name Davenant. Its closure in 2017 leaves the future of the two listed buildings uncertain. The history of the Davenant School in Whitechapel will be presented here in a two-part blog post. Ralph Davenant was the Rector of Whitechapel from 1668 who oversaw the rebuilding of the parish church of St Mary Matfelon in the 1670s. He was a fellow of Trinity Hall, Cambridge, and a descendant of Bishop John Davenant, a moderate Calvinist who had represented the English church at the synod of Dort in 1618; he was also a cousin to the historian Thomas Fuller. Planning for a school for the poor children of Whitechapel began in earnest in 1680, possibly following up an idea conceived by Davenant’s predecessor and father-in-law John Johnson. Johnson’s daughters, Mary Davenant (Ralph’s wife) and Sarah Gullifer, endowed two of three shares of an estate in Essex (Sandon, near Great Baddow) to be overseen by a newly formed body of trustees to maintain the school. When Davenant died in 1681 his will directed that £200 he was owed go directly to the building of the school, and that his goods be sold after his wife’s death to raise money to see the plan through. Mary Davenant lived on and the trustees struggled at first to find a site. However, the easterly stretches of Whitechapel Road were not fully built up in the 1680s and the parish held a large plot on the north side to the east of present-day Davenant Street for almshouses and a burial ground. The easternmost part of this land, a frontage of 50ft, was given up for the school in 1686 and building work ensued. Endowments proved insufficient and in 1701 an anonymous benefactor gave £1000 to clothe as well as educate the children at the ‘School House of Whitechappel Town’s End’. In 1705 the Rev. Richard Welton invested this money in Thames-side land at East Tilbury. The school building of the 1680s was a brick range with a seven-bay front, a single full storey with pairs of hipped dormers in a hipped roof flanking a pedimental centrepiece, all set behind a forecourt garden and enclosing brick wall. The main room on the west side was for the teaching of forty boys, that on the east for thirty girls, above were living spaces for the master and mistress. A single central doorway gave on to an open passage through to a garden at the back, the schoolrooms evidently entered from the sides of this passage. An aedicular niche above the main entrance rising up to the open pediment is said to have stood empty until the late eighteenth century, awaiting a figure of Davenant for which funds never stretched. Samuel Hawkins, the school’s Treasurer, then acquired and saw to the painting of a scrapped wooden statue of a figure in clerical dress to make up the deficit. There were further benefactions and by the 1790s the premises, already enlarged westwards after 1767, had been extended at the back. 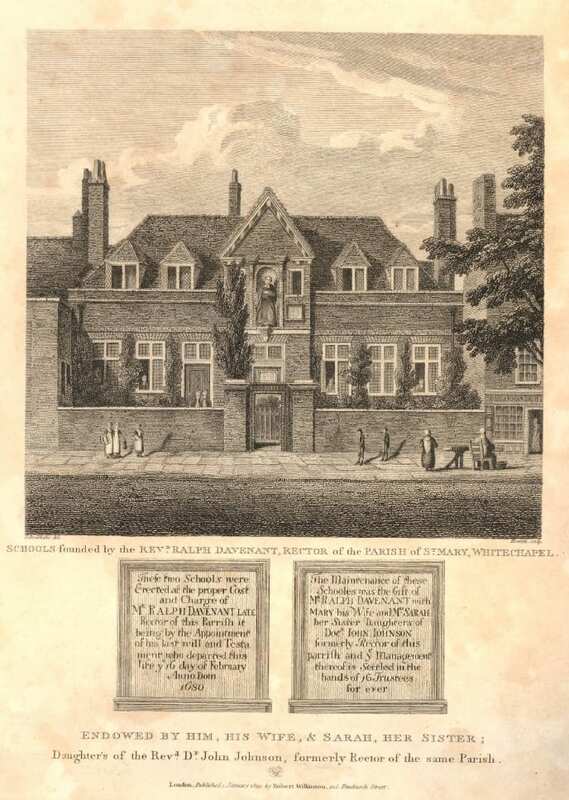 In early 1806 the Trustees decided to double the number of children and a shed and ‘dust-bin’ behind the school were converted to form an additional schoolroom. Anticipating the increased attendance, one of the Trustees, William Davis (1767–1854), the co-proprietor of a sugarhouse on Rupert Street who was to found the Gower’s Walk ‘school of industry’ in 1807–8, saw to it that the Rev. Andrew Bell was invited to Whitechapel to introduce his monitorial (Madras) system of education which had as yet made limited impact. Bell attended the school daily in September 1806 and with Davis’s fervent support and the employment of a trained assistant (Louis Warren, age 13), and then of a schoolmaster (a Mr Gover), both from Bell’s base in Swanage, they successfully established a showpiece in Whitechapel for wider evangelisation of the benefits of Bell’s monitorial system. This gained influential Anglican support and led in late 1811 to the foundation of the National Society for the Education of the Poor in the Principles of the Established Church in England and Wales. The episode has caused the Davenant School to be hailed as the cradle of England’s ‘National’ schools. Block plan showing Davenant and related school buildings and principal nearby sites as in 1953 (buildings of 2016 in grey), drawing by Helen Jones for the Survey of London. Please click on the picture for a larger view. Its architect remains unknown, though for circumstantial reasons Samuel Page is a candidate, as will be explained. It was a single-storey stock-brick barn of about 80ft by 120ft. Its round-headed window openings, some very tall, had cast-iron Gothic tracery. There were porches at both ends and a western clock turret. The main square room to the west was for the teaching of 600 boys, with a half-sized room beyond for 400 girls, all convertible into a single space. Two rows of square timber posts helped support a vast queen-post truss timber roof. There was a hot-air heating system, devised and paid for by Davis with John Craven, another Goodman’s Fields sugar-baker. Tom Flood Cutbush (the son-in-law of Luke Flood, see below) procured an organ, which he played himself, also arranging performances of oratorios in the 1820s. In 1844–5 the Rev. William Weldon Champneys oversaw reconfiguration of the east end, the girls’ room reduced, raised and given a railed balcony to create space below for an infants’ school, with living rooms for the master and mistress. Other subdivision for classrooms in the western corners followed in 1868–9 with G. H. Simmonds as architect. Ordnance Survey map, 1873, showing the Davenant and St Mary Street schools. The west porch was lost when St Mary Street was widened in 1881–2. George Lansbury, an alumnus around 1870, recalled ‘what a school-building! 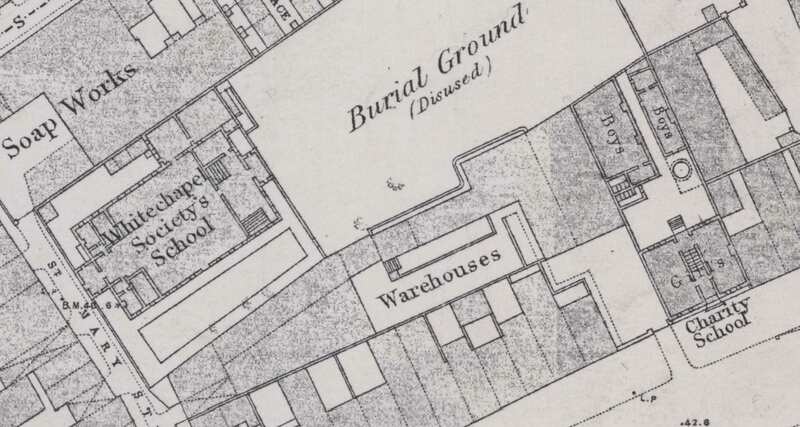 No classrooms, one huge room with classes in each corner and one in the middle.’  The east part of the burial ground, disused from 1853, was taken for a playground from 1862. This was shared with the Davenant School as well as the Whitechapel Union, for which a disinfecting house was inserted in the ground’s north-east corner at the south end of Eagle Place in 1871. This workhouse shed gained notoriety as the mortuary to which some of the victims of ‘Jack the Ripper’ were taken in 1888. It was thereafter replaced. The National School was also known as the Whitechapel Society’s School, St Mary’s School or St Mary Street School. In 1874, 360 children were presented for examinations, a decade later 443. It had less cachet than the Davenant School, which, to Lansbury, was for ‘“charity sprats” – girls and boys dressed in ridiculous uniforms’. After administrative changes there were adaptations in 1889–90, including the addition of a caretaker’s house to the north. The school continued under London County Council maintenance as Davenant Elementary Schools, its roll gradually declining from 784 in 1900 to 300 in 1938. It closed in 1939. After post-war use as a second-hand clothing warehouse and despite calls for its preservation, the building was demolished in 1975. 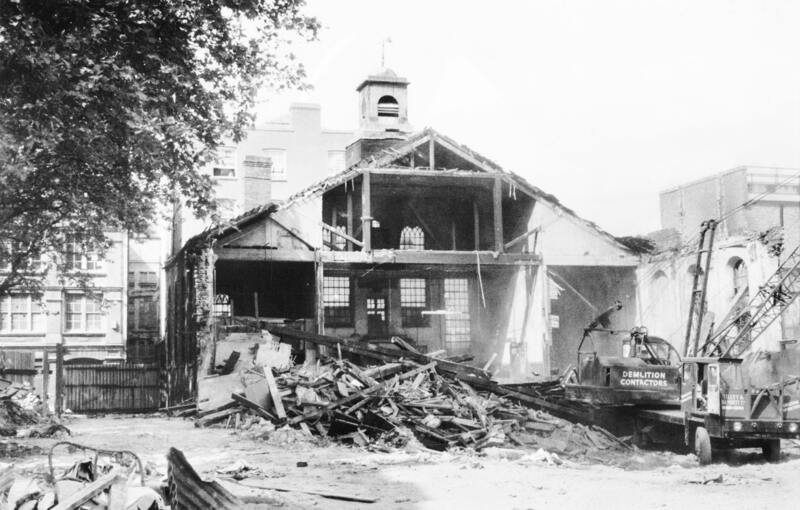 Rebuilding of the original schools of the 1680s by the Charity School Trustees followed hard on the heels of the opening of the National School. Larger premises were wanted to accommodate 100 boys and 100 girls, again for the application of Bell’s system. The funding of this project had been given a start by Samuel Hawkins, who had donated £600 in 1808 for building a new school, and a coachbuilder called Lewis (possibly Thomas Lewis, a coach-master of 45 Leman Street), who gave £500 in 1817. Mathias was still the Rector and the Treasurer for the trustees was Luke Flood (1738–1818), a painter, corn chandler and corrupt magistrate and commissioner of sewers who had premises on Whitechapel Road (on the site of No. 57). Flood left £1,000 to the school when he died in February 1818; this was the most munificent of the period’s gifts. Flood’s son-in-law was the architect Samuel Page who had been acting as a surveyor for the parish since at least 1807. Around 1813 Page was also involved in securing an improved endowment for the school. It seems likely that he was charged with designing the school building; it is a characteristically sub-Soanian work. He was probably working with Thomas Barnes, the local bricklayer and house-builder, another trustee and commissioner of sewers who contributed £100 to the fund in 1818. Major Rohde, a Leman Street sugar refiner, was also a trustee. Another was William Davis, who succeeded Flood as Treasurer. The foundation stone was laid in June 1818 by the Duke of York; completion evidently followed quickly. The Davenant School’s front building of 1818, photographed as the Davenant Centre in 2017, by Derek Kendall for the Survey of London. 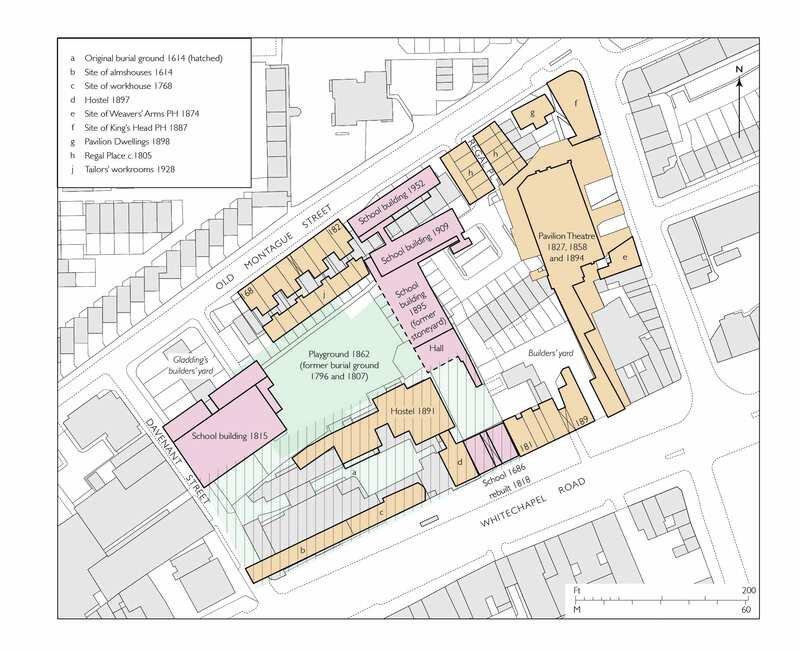 The two-storey and basement five-bay yellow stock-brick building, roughly square on plan, was laid out to align with the workhouse. It originally had steps up to a raised ground floor at its central entrance arch, with a deeper railed area in front of the basement, and a dedicatory stone plaque in a blind arch above the entrance. There was a central staircase and a single classroom to each side on each of the main storeys. In the 1860s, after outbuildings to the west were given up, two blocks were built in the yard for boys, the front range being given over to girls. The plaque had been taken down before major changes in the mid 1890s that were part of a thorough reformation (of which more in the second post). The steps and the staircase were removed with the railings pushed back for a ground floor at pavement level for improved access to new buildings behind – a return to the open passage arrangement of the 1680s. The tympanum of the entrance arch gained a foliate terracotta panel (lost around 1980) and the legend above was changed from DAVENANT-SCHOOL to THE FOUNDATION SCHOOL in 1896, retaining WHITECHAPEL SCHOOL on the central blocking-course parapet above. The schoolrooms were converted in the 1890s to be a chemical laboratory and two workshops, a lecture room, library and dining room, with caretaker’s quarters. Do you have any memories of the Davenant School? 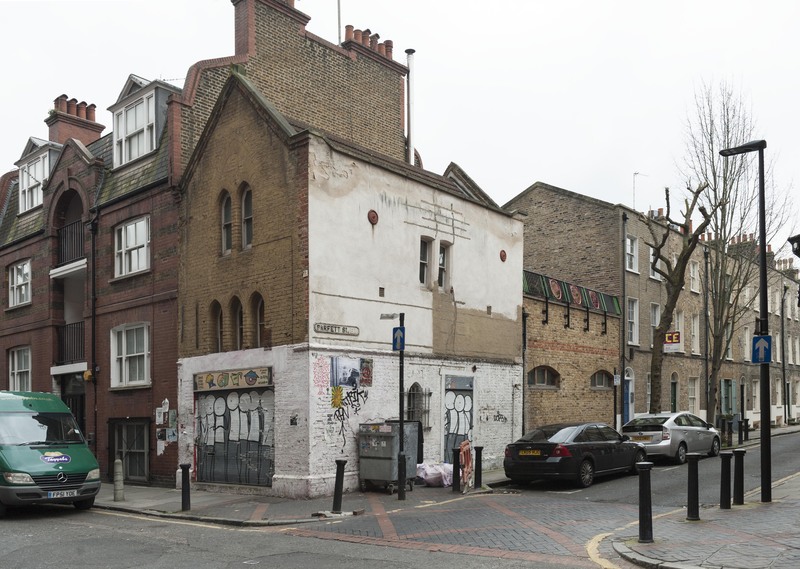 The Survey of London has launched a collaborative website titled ‘Histories of Whitechapel’ and welcomes contributions. Please visit: https://surveyoflondon.org/map/feature/452/detail/#story. 1 – Nikolaus Pevsner, The Buildings of England: London except the Cities of London and Westminster, 1952, p. 426. 2 – As quoted in Roland Reynolds, The History of the Davenant Foundation Grammar School, 1966, p.51.